The continued warm weather here has resulted in a winter with many deep sea fishing twists. When the wind blows a little out of the east and the water is clean we expect to see a few Mahi-Mahi along the reeflline this time of year but they continue to be scarce. We have seen an occasional larger fish but few of the regular sized fish that we like to encounter. There are Kings biting when the water is cloudy and being difficult (as expected) when the water is bright and clear. Some large Bonito have been here and scattered Tuna. Grey Tiles are still biting well on most days and some Goldens have been biting as well in the deeper water. These are great eating fish and we have been fishing them and some Snappers when charters want eating fish. Occasional Wahoo mostly right at the reef?s outer edges. What with the warm weather and the up and down fishing with essentially calm seas one would expect virtually no Sailfish action, but we are chipping away at them fairly regularly. 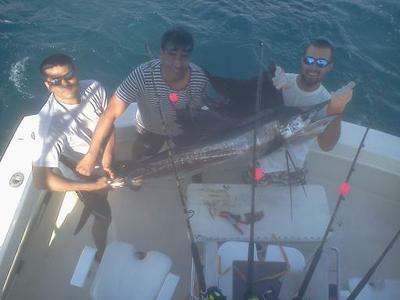 Pictured is the Hussain family with a nice warm weather catch and release Sailfish aboard the Marlin My Darlin. Good sized Sails now when we can catch them. The majority of the smaller ones have moved on.